I really liked Ender's game, and it was an interesting enough read. But OH THE CLICHE STORY-LINE. It's not that this is bad writing. Really, Card did quite a good job when he wrote this. 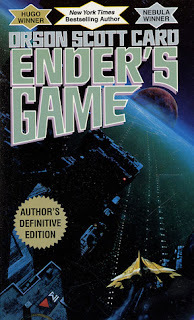 I thoroughly enjoyed reading about Ender and his escapades. But seriously, this entire novel was like watching an episode of Star Trek. But instead of adults, it's starring kids. Also, I feel like it's pretty hard for readers to connect with Ender. I mean, how many six-year-olds, exactly, do you know that can do trigonometry? It just seemed rather unlikely. And even though near the end of the book, he reaches 12 years of age, that's still pretty young for a teenager to be able to connect to. Other than those two major things, the book wasn't that bad. The world in of itself was extremely interesting, with the Battle School stationed in space and all of the advanced technology. Card did a wonderful job with world-building. The biggest issue was that in this fantastic world where there could easily be an interesting story, Card chose to pick the most cliche story line known to man. He had all the right cards- a new world and a fascinating protagonist. But he didn't make his own story, just a copy. So, if you're into sci-fi and you really like Star Trek, and you want to see how an episode of Star Trek may play out if it starred children, then that's Ender's Game for you. This story isn't something that when mentioned I would strongly advise against reading, but it also isn't a story that I would highly recommend.